Enjoyable fantasy nonsense enlivened by some nice ideas, exciting action sequences, strong performances and the commendable decision to play the whole thing straight rather than for laughs. Directed by Timur Bekmambetov, Abraham Lincoln: Vampire Hunter is based on the novel by Seth Grahame-Smith (who both produced the film and wrote the screenplay), author of similar literary/horror mash-up Pride and Prejudice and Zombies. The film begins with young Abraham Lincoln (Lux Haney-Jardine) witnessing the murder of his mother (Robin McLeavy) at the hands of vicious vampire-slash-businessman Jack Barts (Marton Csokas). 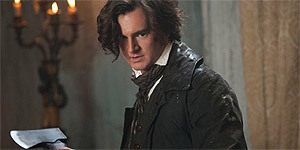 Years later, Abraham (now played by Benjamin Walker) returns seeking revenge and meets mysterious stranger Henry Purcell (Dominic Cooper), who mentors him in the ways of vampire hunting. Despite being warned by Henry not to forge any close connections, Abraham falls in love with Mary Todd (Mary Elizabeth Winstead) and embarks on a political career, working as a lawyer by day and slaying vampires by night. However, when he discovers that vampire leader Adam (Rufus Sewell) has a plan that will plunge the whole country into war, he realises he has a huge fight on his hands. Benjamin Walker is excellent as Lincoln, convincing both as a younger man and as the iconic bearded presidential figure later on. There's also strong support from Csokas (complete with a silver bullet lodged in his eye, the film's best 3D moment), Cooper and Anthony Mackie (as Abe's black best friend), while Sewell is good value as the villainous Adam and Mary Elizabeth Winstead is sweetness and light personified as Mary Todd (their romance, along with large chunks of the first half of the film, is cheekily lifted from It's A Wonderful Life). The inventive script has several nice ideas, most notably turning the entire American Civil War into a war against the Vampire South, but it also adds some interesting new twists to vampire mythology, such as the idea that vampires can't kill each other or that they can briefly become invisible. On top of that, Bekmambetov delivers some terrific fight sequences (no choppy can't-see-what's-going-on editing here) and orchestrates some genuinely thrilling set-pieces, such as a chase sequence during a stampede and an exciting climax involving a train and a burning bridge. The only real problem with the film is that the dialogue is occasionally stilted and while it's commendable that the filmmakers chose to play the whole thing straight, it still could have used a little more in the way of humour. That said, these are minor quibbles that don't really detract from the overall enjoyment of the film. Abraham Lincoln: Vampire Hunter is an enjoyable slice of fantasy nonsense that succeeds thanks to terrific action sequences, impressive special effects, strong performances and an inventive script. Worth seeing.